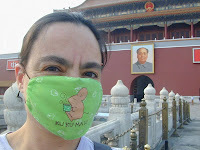 With all the recent talk of swine flu, I can't help but remember my trip to China in the spring of 2003. Facemasks, health questionnaires and eviction from both hotels and entire towns. Ah yes, good times. The downside (other than catching a fatal infection) was having thermometers stuck in my ear at the airports, getting the evil eye from the locals who thought I was spreading SARS and difficulty meeting fellow travelers - since there weren't any. The upside was the kindness of strangers who helped me navigate through the trying times, crowd-free (and virtually people-free) visits to Xian, The Forbidden City and the Great Wall and a once-in-a-lifetime experience. All that and a t-shirt that says "Survived SARS 2003"? Pardon me while I check on the price of flights to Mexico. For details and photos of my SARS adventure, check the April 2003 and May 2003 archives.